Hard water can cause limescale buildup in your home. 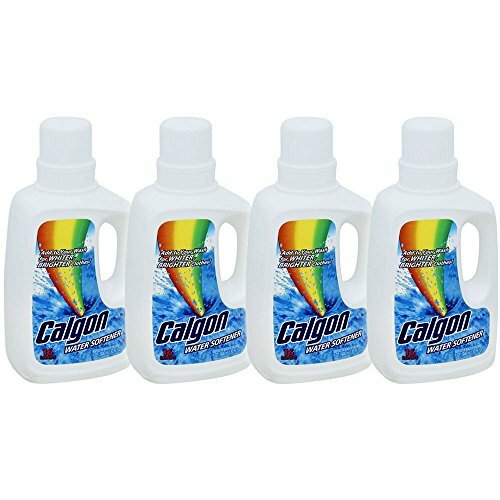 Calgon water softener is a popular product that you can add to your wash to prevent soap scum from forming in your washing machine, get cleaner clothes, and protect your washer from limescale. What Is Calgon Water Softener And How Does It Work? 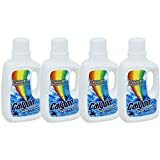 What Makes Calgon Water Softener Unique? How Does The Calgon Water Softener Compare To Other Products? A water softener works by removing some minerals that can be found in water. Removing these minerals is sometimes necessary since their presence can result in buildup inside of plumbing pipes and appliances. You can either install a device to remove these minerals or use a product like a Calgon water softener. This water softener has been one of the highest-selling products on the market for decades. Changes have been made to the formula to eliminate the use of phosphates, but you can still get the same results. You can find this water softener in containers that are similar to laundry detergent or purchase it in powder form. The liquid form is convenient since you can use the cap of the container to dose the product. You can add the liquid or powder to a load of laundry by pouring it directly over the clothes if you have a top-loader washing machine or by using the drawer compartment of your machine. Adding a water softener to hard water is necessary if you want to prevent buildups in your plumbing system and inside of appliances. Drinking water contains different minerals, and these minerals are beneficial to your health. However, high levels of calcium and magnesium change the way water reacts to soap, including laundry and dish detergent. Calcium and magnesium form hard deposits when they come in contact with soap. These deposits are known as limescale or soap scum. The presence of high levels of calcium and magnesium also prevents soap and laundry detergent from dissolving completely. This reduces the efficiency of your washing machine or dishwasher. Limescale can build up inside of plumbing pipes and restrict the flow of water. This can result in damages to your plumbing system, and some of the residues can become dislodged and end up in appliances that use water. Limescale can also appear inside of appliances like washing machines and dishwashers. These residues increase the wear and tear on some moving parts and can shorten the life expectancy of your appliances. Soap scum can form in your bathtub or shower and create an environment in which bacteria thrive if you have a vinyl shower curtain. If there is hard water in your home, you might have a hard time with cleaning dishes and clothes. Soap scum can leave marks on dishes and clothes, and your clothes might feel stiff or have an unpleasant odor after you wash them. Hard water can also make laundry detergent less effective and result in dirt remaining trapped in the fabric of your clothes. This increases the wear and tear on your clothes. Calgon’s product contains zeolite and polycarboxylates. Zeolite is a volcanic mineral, but it is possible to produce it industrially. There are several health benefits associated with this mineral since it can eliminate toxins. Zeolite is made out of oxygen molecules that have bonded with silicon or aluminum ions. These molecules have a negative charge. This means that some molecules will bond with them, some will exchange ions, and some larger molecules will be broken down into smaller components. Calcium and magnesium molecules present in hard water have a positive charge. Ion exchange occurs when these molecules come into contact with the zeolite molecules. This prevents the calcium and magnesium molecules from reacting with the soap or detergent. Polycarboxylates have a similar mechanism of action. These compounds are often used in laundry and dish detergent. They bond with calcium and magnesium molecules that have a positive charge and prevent limescale from forming. Using a water softener is necessary if there are high mineral levels in your tap water. If you aren’t sure about whether there is hard water in your home, pour some tap water in a saucepan and let it evaporate. Hard water will leave a limescale deposit behind when it evaporates. Calgon has been making water softener for decades. You can count on this brand to deliver a quality product and get the same results every time. This water softener is very affordable and easy to dose. All you have to do is add a dose of water softener every time you do laundry to prevent soap scum from forming on your clothes and in your washing machine. The formula is simple, and the product uses ingredients that work. There are no negative effects on the environment or your health. Using a water softener that you can pour directly into your washer is more affordable than installing a device that filters water and removes unwanted minerals. Installing a filtering device is justifiable if your water has high levels of minerals. This method will protect your plumbing system from limescale buildups. However, hard water doesn’t always justify the expanse of a filtering system. If the calcium and magnesium levels are high enough to be an issue when you do laundry or wash dishes but don’t pose a serious threat to your plumbing pipes, using a product like Calgon water softener makes more sense. You will get consistent results with an affordable product. We also like this product because there is no fragrance added. It is best to avoid products with added fragrances if you have sensitive skin or already use a laundry detergent that contains fragrances. Prevents residues from forming inside of the washer and reduces wear and tear on the parts. Prevents limescale from ending up inside your plumbing system every time you use your washer. Soft water helps laundry soap lather. You will get cleaner clothes and use less detergent. Soap scum can form hard residues on clothes, damage the fabric, and trap dirt inside of fabric. Washing with soft water reduces wear and tear on clothes and makes them cleaner. Soap scum can irritate if you have sensitive skin. Water softener helps prevent this. You can find this water softener at Walmart. A 32-ounce bottle costs a little over $5. You can also order this product on Amazon. We found a pack of three 32-ounce bottles for a little over $26, and a pack of four bottles for just under $32. Buying this product in bulk makes sense since you will need to use water softener every time you wash clothes if there is hard water in your home. 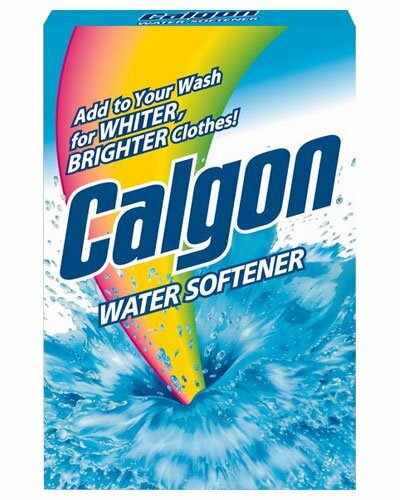 The fact that Calgon has been making water softener since the 1930s speaks volumes about the quality of the product. This water softener also has a rating of 4.5 out of 5 stars on Amazon. Shoppers talk about seeing a difference right away. They typically need to use half a cap of water softener for a load of laundry. The product eliminates stains and residues. Clothes feel cleaner, and the musty smell that hard water sometimes causes is completely gone. Some shoppers also noticed that using the water softener made towels softer and more absorbent. They say they can clean their clothes with less laundry detergent. The liquid is easy to measure thanks to the cap. It dissolves right away and removes issues associated with hard water. The water softener is sold as a product you can use when you do laundry, but shoppers who have hard water in their homes have found many other uses for the product. Some people talk about using the water softener in their dishwasher, adding it to their bath to keep limescale away from bathtubs and shower curtains, and using it with cold water to wash food stains. Reviews mention a drawback associated with purchasing the product online. Some shoppers talk about receiving bottles that leaked during shipping. You can avoid this issue by purchasing this water softener at a local store and storing it carefully. There are other brands with similar products. You should test a few different options and see what works best since hard water has different mineral levels based on your area. This water softener is similar to Calgon’s product except it uses phosphates. These compounds work in a way that is similar to the ingredients you will find in Calgon’s product. 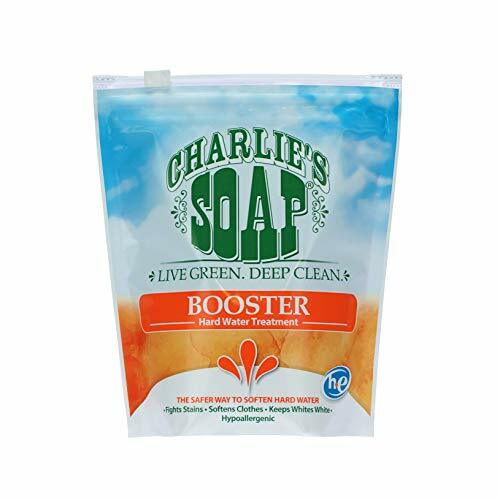 Charlie’s Soap Laundry Booster And Hard Water Treatment is an interesting alternative to Calgon’s product because it is very affordable and you can purchase it in bulk. The phosphates used in this water softener are safe for the environment as long as you use the recommended dosage. You can use one tablespoon of the product per wash. If you need to use more of the product to get rid of limescale, the product might not be safe for the environment, and it would be best to stick to the product made by Calgon. 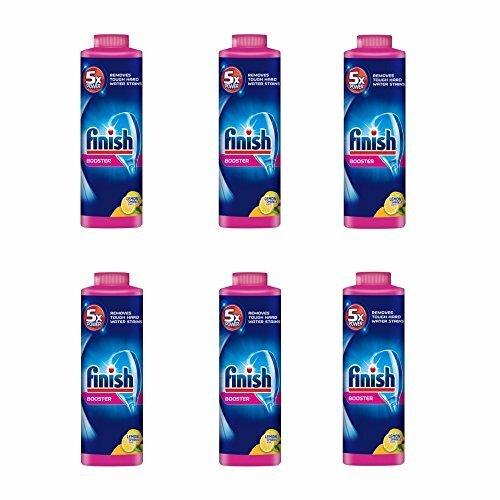 While Calgon’s product is made to be used when you do laundry, Finish’s product is designed to be used in your dishwasher. It comes in powder form, and all you have to do is add two tablespoons to the bottom of your dishwasher. The downside of this product is that it contains fragrances. These compounds will add a pleasant smell and help eliminate odors in your dishwasher, but they might not be ideal for the environment. However, this water softener is worth trying if you see water spots on your dishes. Citric acid might work better than the ingredients used by Calgon if there are high levels of calcium and magnesium in your water. This is another water softener designed to be added to your dishwasher. It uses citric acid to eliminate residues caused by hard water. Unlike Finish’s product, this water softener comes in liquid form. All you have to do is fill the water softener tank on your dishwasher, and this product will be added during the rinse cycle. Introducing a water softener during the rinse cycle eliminates water spots and prevents limescale deposits in your dishwasher without impacting how the dish detergent works. Citric acid molecules can bond with the different compounds of some dish detergents and make the dish detergent less effective. This is why you should try introducing a water softener during the rinse cycle instead of when you start washing dishes to get better results. Hard water can lead to several costly problems around your home. It can damage your plumbing and increase wear and tear on your appliances. Hard water can also make it difficult to properly clean your clothes and dishes. If you are dealing with soap scum residues, it is time to take action. The Calgon water softener is an excellent choice since it uses effective ingredients and softens water. It is easy to add half of a cap of water softener every time you do laundry to prevent limescale buildup in your washer and get cleaner clothes. This product is very affordable, the brand is transparent about the ingredients used, and it will help you save money since you will need less laundry detergent and wear and tear on your wash will be reduced. This water softener is an excellent addition to your pantry if there is hard water in your home. You should see a difference right away and using it regularly will prevent hard water from damaging your appliances and plumbing system.